In the tradition of Jaron Lanier’s You Are Not a Gadget, a rousing, sharply argued—and, yes, inspiring!—reckoning with our blind faith in technology Can technology solve all our problems? Despite overwhelming evidence to the contrary, many of our most famous journalists, pundits, and economists seem to think so. According to them, “intelligent machines” and big data will free us from work, educate our children, transform our environment, and even make religion more user-friendly. This is the story they’re telling us: that we should stop worrying and love our robot future. But just because you tell a story over and over again doesn’t make it true. 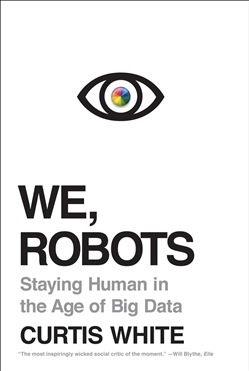 Curtis White, one of our most brilliant and perceptive social critics, knows all about the danger of a seductive story, and in We, Robots, he tangles with the so-called thinkers who are convinced that the future is rose-colored and robotically enhanced. With tremendous erudition and a punchy wit, White argues that we must be skeptical of anyone who tries to sell us on technological inevitability. And he gives us an alternative set of stories: taking inspiration from artists as disparate as Sufjan Stevens, Lars von Trier, and François Rabelais, White shows us that by looking to art, we can imagine a different kind of future. No robots required. Acquista We, Robots in Epub: dopo aver letto l’ebook We, Robots di Curtis White ti invitiamo a lasciarci una Recensione qui sotto: sarà utile agli utenti che non abbiano ancora letto questo libro e che vogliano avere delle opinioni altrui. L’opinione su di un libro è molto soggettiva e per questo leggere eventuali recensioni negative non ci dovrà frenare dall’acquisto, anzi dovrà spingerci ad acquistare il libro in fretta per poter dire la nostra ed eventualmente smentire quanto commentato da altri, contribuendo ad arricchire più possibile i commenti e dare sempre più spunti di confronto al pubblico online.